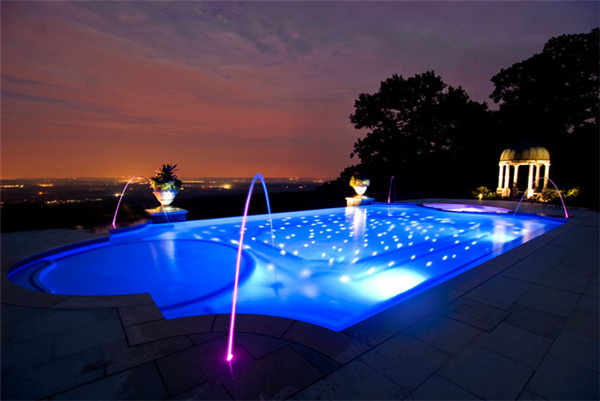 As we all know, swimming pools have been around for a long time and play an important part in space decoration. It is reported that swimming pools go back more than 5000 years according to archaeological findings. 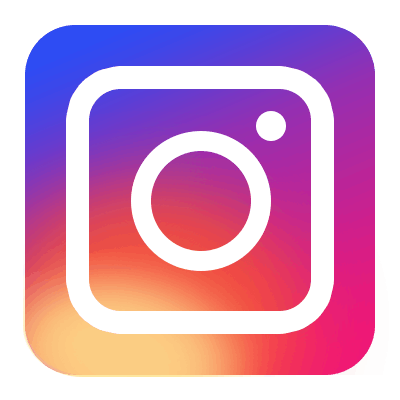 Design trends always refer to the new materials, technology and pool features arriving on the market. While now, most pool owners have more options than before to add interest and character to their pool. So, the following are top 8 design trends for swimming pools in 2017. A traditional in-ground swimming pool has distinct edges, typically with a deep end and a shallow end. We often jumping or taking the stairs to get into the pool that has relatively consistent depths, a shallow end around 3’ to 4’ and a deep end about 8’ deep. The newest trends for 2017, nevertheless, turn the convention on its head. Water keeps on going, blending seamlessly with the sky. Beach entry creates the same smooth walk into the water that you’d experience at the ocean. Tanning ledges allow for pool enthusiasts to enjoy a few cool, refreshing inches of water while still getting plenty of sun. Also known as a lounging ledge, this shallow waterbed, with 12’’ or less of water, is perfect for keeping cool in the water while exposing yourself to a nice sun for tanning and relaxing. Tanning ledges are ideal for relaxing in chaise lounges, enjoy splash tike with toddlers or cool off without the treading water’s efforts. Perimeter overflow pools allow water to overflow the pool’s edges, where it is captured and recycled back into the pool water. That’s similar to the fountain, but is over the whole pool. The constantly moving water has a wonderful and calming sound and relaxing nature. As a bonus, it also tends to be self-cleaning. Looking to the fashion trends of swimming pools, glass mosaic tile, ceramic mosaic tile and stone mosaic tiles are getting more and more popular for the material of pool. You know the concrete bottomed pools are out of date. Against the water, the reflective quality of glass mosaic tiles is perfect to used in the whole pools and as a luxurious accent. With beautiful colors and patterns, the tile makes a spa-like feel that will enhance your swimming experience rich. 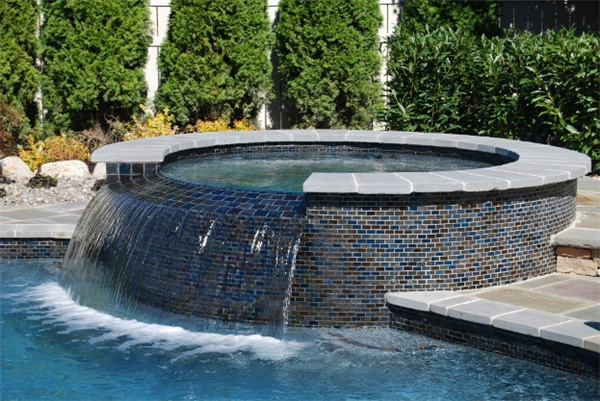 Although you just use a glass mosaic waterline tiles, it still creates a gorgeous look to pool. As for stone tiles, it is more stunning and traditional, romantic. The smoother surface is also more soothing for bare feet. For most pool owners, they choose to make a combination of the elements of fire and water to make fascinating effects and level up the pool’s appearance. Fire bowls add lights that sparkles on the water surface at night. Moreover, they make the swimming pool more elegant and luxurious. Water feature is diverse and makes your outdoor living experience richer. A relaxing atmosphere is created by the sound of falling water and flowing water’s nice visual effect. Hydrotherapy jet is not only for SPAS and physical therapy pool anymore, it is popular for home pools now. The relaxing jets can change your backyard space into an nice oasis and bring a sense of peace and relaxation to your home. 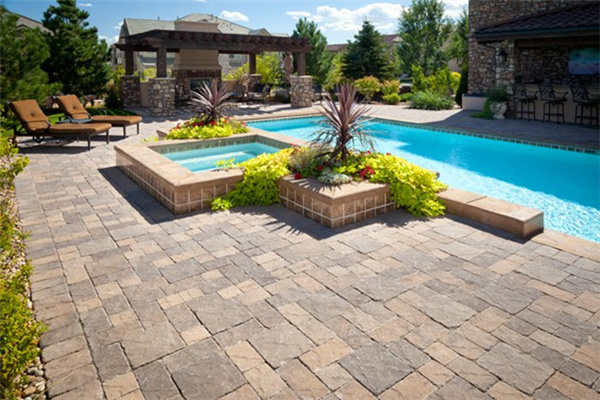 Around the pool areas, there are natural concrete and stone pavers. 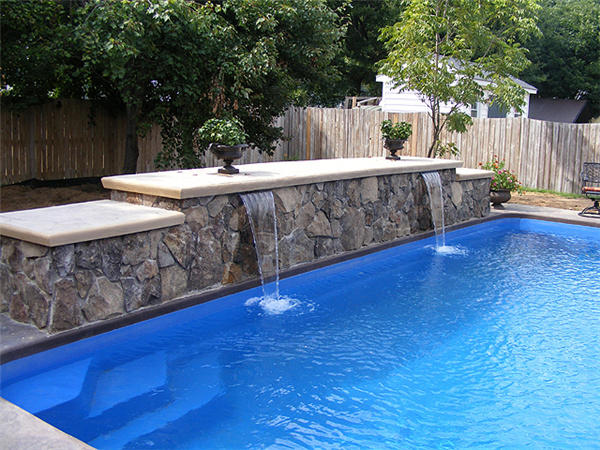 Stone and concrete come in variety of colors and will blend nice with different styles pool decorations. 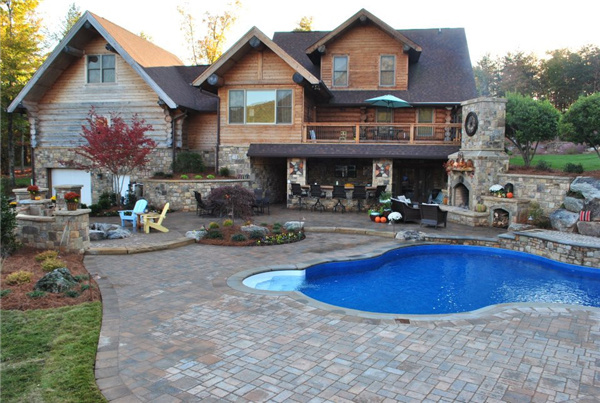 Due to the durability, concrete can hold up to plenty of traffic in the pool area. Standard white poolside chairs and a table with an umbrella aren’t cutting it anymore. Want the ultimate pool experience in your backyard? Then you need the poolside patio decoration, just take your elegant style into consideration. While now the dated trend include the exotic wood, travertine and marble to be blended together to create a relaxing and stunning effect that will not out of place in spa. It is no exception to go green in the pool area, eco-friendly trend is always one of the foremost consideration for many modern decorators. With a geothermal and solar heating, the pool is provided with a comfortable water temperature even in the late spring and early fall when the air can be a bit too crisp. Bio pools are another eco-friendly choice, these natural pools use plants and other biological filters, rather than harsh chemical substances, to clean and refresh the pool. It is another fun way to enhance your pool area to connect the swimming pool with outdoor living area. Take some quality furniture which is water-resistant and well designed to highlight the pool. Your grill, patio and outdoor living area can be blended seamlessly with the pool area to make a stunning outdoor space, which will make your family to enjoy time. All in all, pool design is developing constantly. Every year, every season, there are new changes and advances in pool design and this year’s trends are sure to delight and impress. Remember that it is wise to make a classic one so that your pool decor should not be changed frequently. So if you are tired of your pool design, then let’s do it now!